Your North End experience begins at the lifeblood of Boston, the Boston Harbor. Walk through a scenic waterfront park, with views of the harbor, East Boston and the historic wharfs lining Atlantic Ave. We’ll make our way to the heart of the North End, with views of some of the most historic sites and properties in the neighborhood, some dating back to the late 1600s and early 1700s. Delicious food is never far away in the North End. Your guide will introduce you to a small, hidden Italian bakery serving up fresh bread daily. Break bread with your fellow travelers and let the carbs give you the energy to continue your adventure! A proper Italian salumeria is next, and you’ll have a chance to enjoy Italian meats and cheeses at their finest and freshest. Next up, we’ll take in the energy of the North End’s busiest corridor, Hanover Street. It’s time for a mid-tour break with your guide at a traditional Italian café. Here, you will have a chance to enjoy your choice of a classic cappuccino, espresso, or tea. Let the caffeine kick in as we go back in time into North End history. You’ll hear stories about some of the most influential events that have happened in Boston, including Paul Revere’s midnight ride. We will make our way to the Old North Church and step inside the hallowed walls. To this day, North Enders still attend this church, which is famous for its role in the Revolution. After Church, we’ll dive deeper into the local side of the North End. A taste of pizza awaits at a neighborhood favorite and the stories are endless. 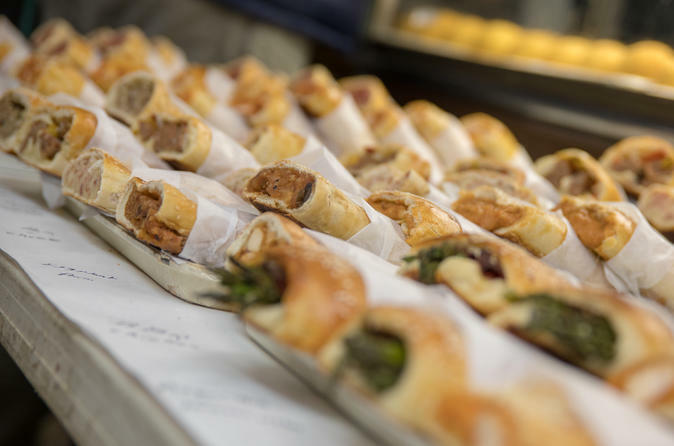 We cap off the North End food experience with samples of the best of the best Italian pastries along the back streets of this delicious neighborhood. Hopefully there will be a chance to meet and chat with the area’s top bakers, if we catch them at a quiet moment. After the tour, you’ll surely be ready to make a dinner reservation. Consult with your guide for the best recommendations and we’ll set you up for an amazing time in Boston.